Well, we’ve seen this movie before. 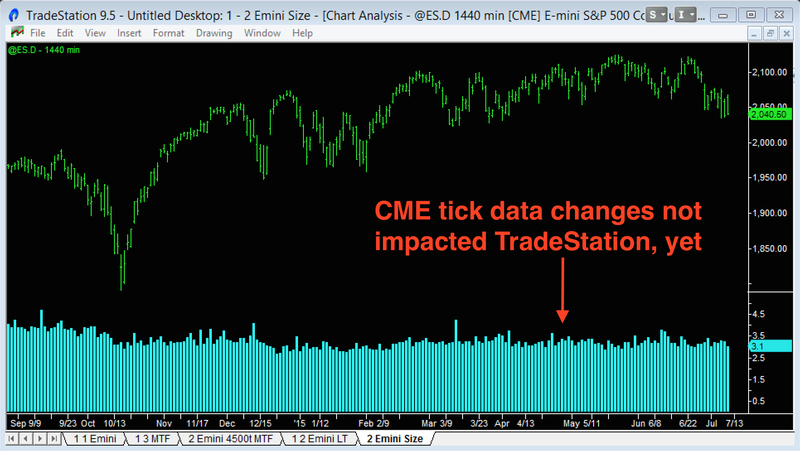 The CME changes the way it defines a “trade” and our tick chart settings need to change. 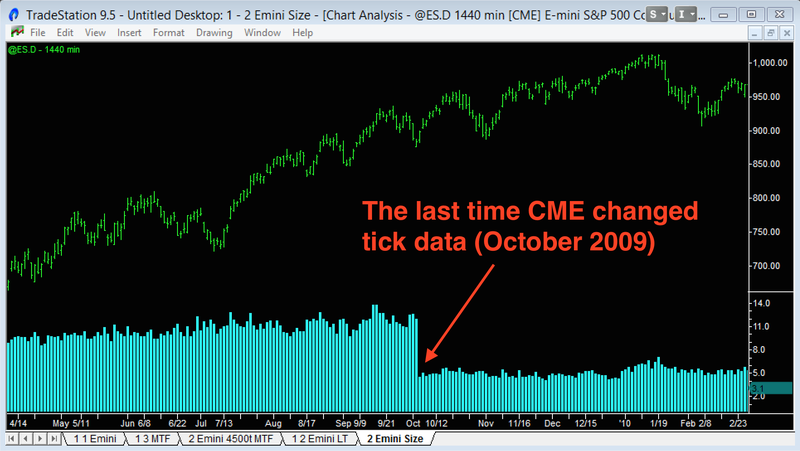 The last time this happened was in October 2009 when the CME decided to un-bundle trades. The result was the average trade size went from approx. 11 to 5 contracts (see the chart above). And my tick charts had to be changed from a 233/699/2097 combination, to the current 500/1500/4500 ticks. In practice, the average trade size still “spiked” when Professionals stepped in and so Better Pro Am was still able to detect Professional activity. So maybe a storm in a tea cup? Now it looks like the CME are reversing direction and going back to bundled trades! At the end of 2014, the CME released a new data feed protocol called MDP 3.0. All data providers need to switch to this new protocol by October 2015. After that, the old CME data feeds will be disabled. In this new data feed, trades are “bundled” and attributed to the “aggressor”. So if a buyer steps in and picks up 3 orders each of 5 contracts sitting at the Ask, this will be shown as: 1 trade for 15 contracts done at the Ask. Previously, it would have been 3 trades each for 5 contracts done at the Ask. However, the individual trade data will still be transmitted in the MDP 3.0 data feed! CQG/Continuum cut over in May 2015 to the new data feed with bundled trades and average trade size for the Emini increased by a factor of approx. 3. However, in June 2015 they appeared to reverse course (trader outcry?) and switched the data feed to un-bundled. DTN IQFeed and Rithmic have both announced they will distribute un-bundled data. DTN IQFeed will implement the new CME data feed from 13 27 September 2015. It also looks like DTN IQFeed will provide TickID data so customers and 3rd party software providers can “re-bundle” trades if they want to. eSignal plans to cut over to the new data feed on 13 October 2015 and it “appears” (sorry, can’t be more definitive as the communication has been woeful) they will be distributing bundled data. eSignal users are reporting that their (bundled) 200 tick bar charts are equivalent to a (un-bundled) 500 tick bar chart using TradeStation, etc. 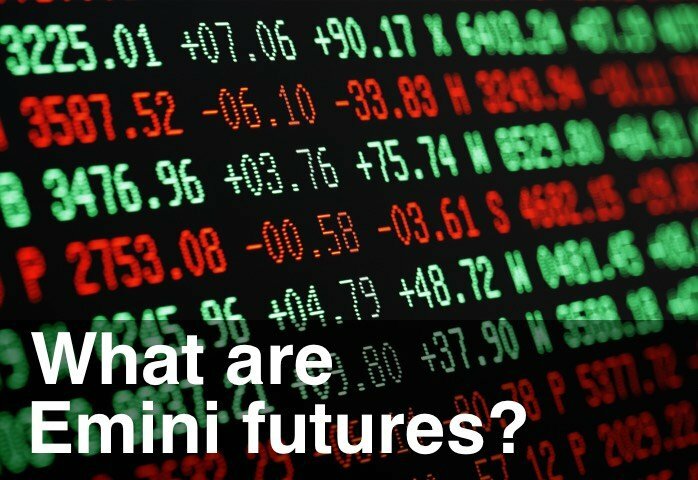 For a more detailed discussion of the issues, check out this thread on Big Mike’s Trading Forum, this thread on NinjaTrader’s Support Forum or add comments to this Google+ post. Hopefully TradeStation will make a formal announcement on what they plan to do. But in the meantime, this is the chart I’ll be watching closely (average trade size, Emini daily). Any large fluctuation in average trade size will indicate the data feed has changed. I’ll update this post as more information becomes available. Plus recommend any changes necessary when using the ‘Better’ indicators. The early mover, CQG/Continuum, switched back from bundled to un-bundled data after, what I assume was, trader outcry. All the data providers seem to have adopted un-bundled data and there appears to be almost no difference between pre- and post-MDP 3.0 data. The average trade size is virtually identical and Better Pro Am continues to identify Professional and Amateur activity.